As one of my articles is the number one result for a search term Google has extracted the relevant information into a featured snippet. I was updating the data and used it as an opportunity to see how quickly Google would update the snippet. 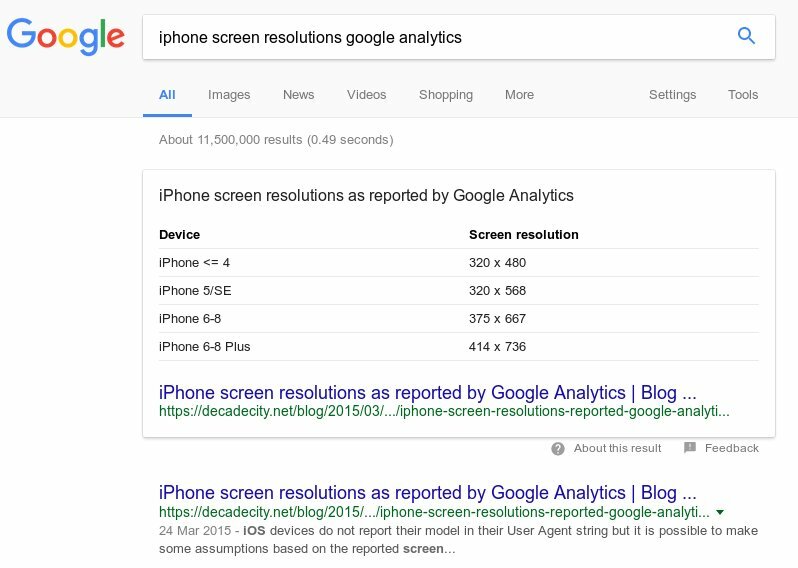 The first change was made at 14:55 on January 19 and I set up a simple curl daily cron job to pull the search engine results page (SERP) containing the featured snippet. 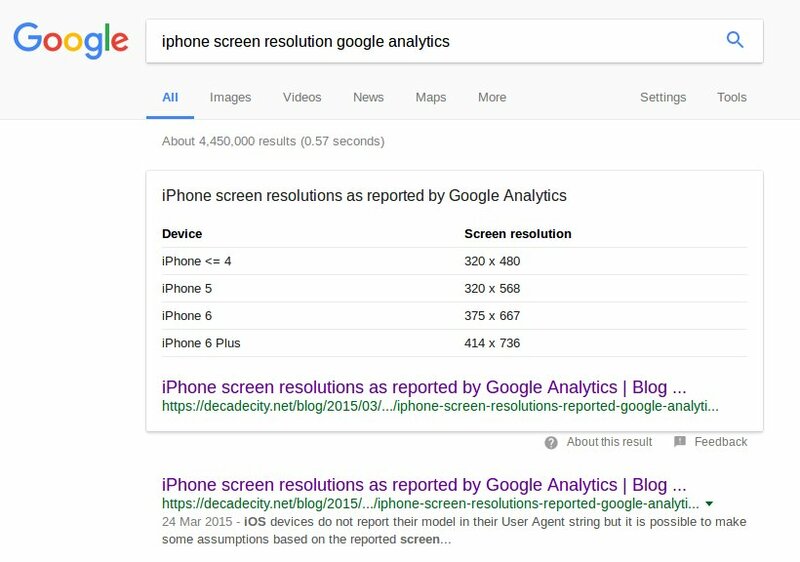 Made a change to the source data on my site that Google's using to generate this featured snippet, now to see how long it is before I see that change reflected on Google's copy. Checking back the next day I found that the snippet had been updated. Well, that was significantly quicker than I expected! Googlebot crawled the page yesterday evening and the featured snippet has already been updated. 66.249.64.17 - - [19/Jan/2018:04:22:31 +0000] "GET /blog/2015/03/24/iphone-screen-resolutions-reported-google-analytics HTTP/1.1" 200 5456 "-" "Mozilla/5.0 (compatible; Googlebot/2.1; +http://www.google.com/bot.html)"
66.249.64.17 - - [19/Jan/2018:19:29:41 +0000] "GET /blog/2015/03/24/iphone-screen-resolutions-reported-google-analytics HTTP/1.1" 200 5466 "-" "Mozilla/5.0 (compatible; Googlebot/2.1; +http://www.google.com/bot.html)"
By the time my daily cron job ran 13 hours later, Google had updated. I wasn't expecting things to happen anywhere near that fast so I needed to change to an hourly granularity to capture the next change - which was made at 12:44 on January 25. Made another change to the source data for this and I've now got an hourly check on the results. 66.249.64.16 - - [25/Jan/2018:09:40:14 +0000] "GET /blog/2015/03/24/iphone-screen-resolutions-reported-google-analytics HTTP/1.1" 200 5484 "-" "Mozilla/5.0 (compatible; Googlebot/2.1; +http://www.google.com/bot.html)"
66.249.64.16 - - [25/Jan/2018:13:03:15 +0000] "GET /blog/2015/03/24/iphone-screen-resolutions-reported-google-analytics HTTP/1.1" 200 5496 "-" "Mozilla/5.0 (compatible; Googlebot/2.1; +http://www.google.com/bot.html)"
66.249.64.17 - - [25/Jan/2018:18:02:44 +0000] "GET /blog/2015/03/24/iphone-screen-resolutions-reported-google-analytics HTTP/1.1" 200 5496 "-" "Mozilla/5.0 (compatible; Googlebot/2.1; +http://www.google.com/bot.html)"
66.249.64.197 - - [25/Jan/2018:22:07:06 +0000] "GET /blog/2015/03/24/iphone-screen-resolutions-reported-google-analytics HTTP/1.1" 200 5496 "-" "Mozilla/5.0 (compatible; Googlebot/2.1; +http://www.google.com/bot.html)"
66.249.79.3 - - [25/Jan/2018:23:18:15 +0000] "GET /blog/2015/03/24/iphone-screen-resolutions-reported-google-analytics HTTP/1.1" 200 5496 "-" "Mozilla/5.0 (compatible; Googlebot/2.1; +http://www.google.com/bot.html)"
Judging by the SERPs collected by the cron job the changes were added between 0030 and 0130 on 26 January. That's around 12 hours for the update. Subtle, but it's there. That took Google just under 12 hours to pick up the change in the source and update the featured snippet. Need more help with your SEO? Get in touch.